I can't find correct information about degaussing cable in BB-CV Ise. Some models haven't the cable, and 1944 pictures are very bad. There´s no good pics available which show the degaussing cable for BB/CVX Ise. But except for one. You will need very good hawk eyes to detect them. I see researchers, modelers and ijn bookpublisher´s staffs the world over have not been able to detect, maybe or not,becoz they have bad eyes and due lack of guts to check them through. I´m sorry to say this. As i said in other places, i ´m not supposed to give direct answers to "columbus´s egg", it ´s totally up to you to find out clues to the issue in toil and sweat. I can view in these captures, the degaussing cable only in the stern. In bow an central views I can view some debris what seems like a cable. 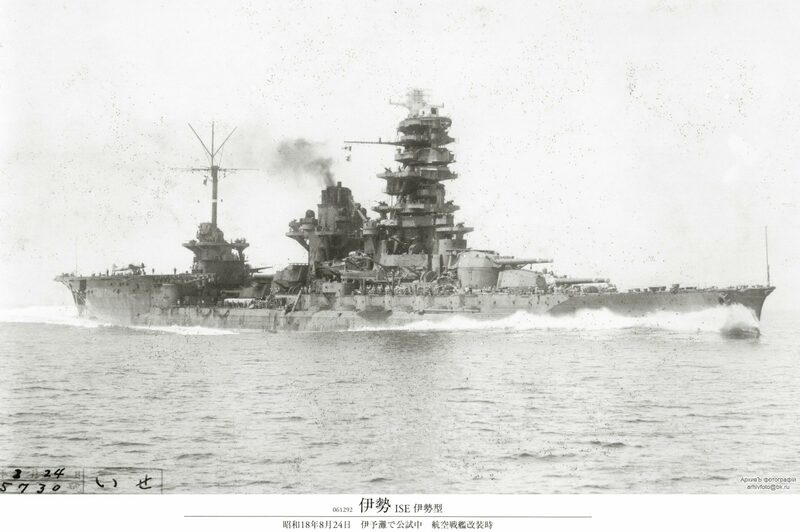 Is it posible that the degaussing cable, was diferent to others japanese ships? Maybe similar to German ships: a continuos tube without transverse backing. Another one which shows "traces" position of the removed degausssing cable. Anyway, I think that the cable is a different model of the standard IJN. Do you think about? Last edited by Mutsuo Sasaki on Thu Jun 04, 2015 5:02 am, edited 1 time in total. Is it possible that it was deleted during the conversion? Post subject: Did Ise carry planes and catapults at Cape Engano? Did Ise carry planes and catapults at Cape Engano? Last edited by Timmy C on Sat Apr 18, 2015 1:13 am, edited 1 time in total. Post subject: Re: Did Ise carry planes and catapults at Cape Engano? No planes aboard...the unit assigned to them (Air Group 634) was sent to Formosa before the Battle of Leyte Gulf and subsequently decimated in sorties against Task Force 38.
there are plenty of errors and misconceptions, both major and minor in Fujimi´s 1/350 kit version. Better wait untill a new Gakken CX/BB Hyuga will come out one day. This will tell you a lot more. It's been 3 years: Has this reference book come out? No. Gakken went out of business. It has been resurrected, but no hint of any of these type volumes as of yet. The purpose of CASF threads isn't to highlight other people's builds for the sake of bringing attention to them, but to discuss the historical features of the real ships and accuracy of kits and models. If someone wanted to talk about a 1928 Hyuga (perhaps in the form of "what's the difference" or "what are my options for"), then bringing in that build as a reference point would be appropriate. Otherwise, there's little reason for why it should be mentioned. While some people do post links in CASF to their or other people's builds, there's no obligation (nor, indeed, desire by the mods) to make it a common occurrence. A lot of people asked for it so its out (soon) 1/700 IJN Ise 1941. Miguel pointed our in upcoming plastic releases section we have a 1/700 Hyuga 1941 coming out soon. A 1/350 of the 'all gun' versions of these ships would be excellent! Has anyone attempted a kit bash of the 1/350 Ise in 'all gun' guise? I note from the box contents the upper deck goes all the way to the stern. I'll have a couple of spare turrets left over after my Fuso & Kongo builds - are these the same as on Ise and Hyuga? I'll have a couple of spare turrets left over after my Fuso & Kongo builds - are these the same as on Ise and Hyuga? Prety much I think, I would probably use them in the central position anyway, and move the purpose built central turrets to the aft, where they would be more visible (just incase of unforeseen discrepancies).